Kerrys Foods Direct To Store had a simple brief: A small stand in a quiet part of the hall that needed to incorporate a full sized commercial chiller unit, meeting area and a large storage area. It also needed to be eye catching to compensate for the site within the hall. 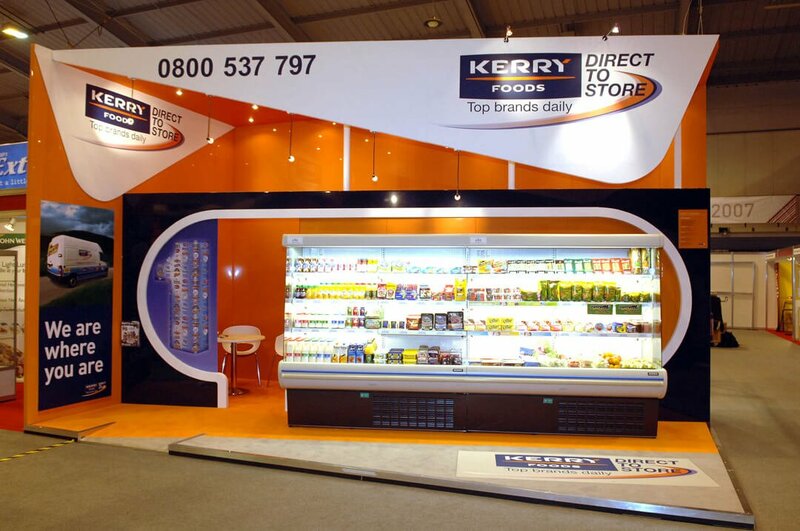 We oriented the stand towards the busiest thoroughfare in this part of the hall and used mostly the strong orange tones from the Kerry Foods brand logo to create a bright, stand out environment that couldn’t be missed! We build the stand to 5 metres in height so that it was higher than all of it’s neighbours for even better visibility within the halls. Clever use of space allowed the chiller unit displaying Kerry Foods product to be not only prominent but also to have plenty of standing room in front of it so that visitors did not have to stand in the aisles to view it, as had previously been the case. A semi-private meeting area was located to the side which still allowed a view of the stand and the storage was tucked away beyond this, but was still easily accessible for re-stocking and give-ways.